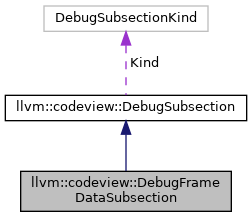 Definition at line 41 of file DebugFrameDataSubsection.h. Definition at line 43 of file DebugFrameDataSubsection.h. Definition at line 59 of file DebugFrameDataSubsection.cpp. Definition at line 36 of file DebugFrameDataSubsection.cpp. Definition at line 46 of file DebugFrameDataSubsection.h. Definition at line 43 of file DebugFrameDataSubsection.cpp. References llvm::codeview::EC, llvm::makeArrayRef(), llvm::codeview::FrameData::RvaStart, llvm::sort(), llvm::Error::success(), llvm::BinaryStreamWriter::writeArray(), and llvm::BinaryStreamWriter::writeInteger().